IP addresses and AS numbers are shared resources, available for use by anyone who can demonstrate the need for them. APNIC policies ensure these resources are distributed fairly and consistently across the whole Asia Pacific region. Every consensus process has its own flavor, the APNIC Policy Development Process makes decisions during the Open Policy Meeting (OPM), which is part of the Policy SIG meeting at each APNIC conference. 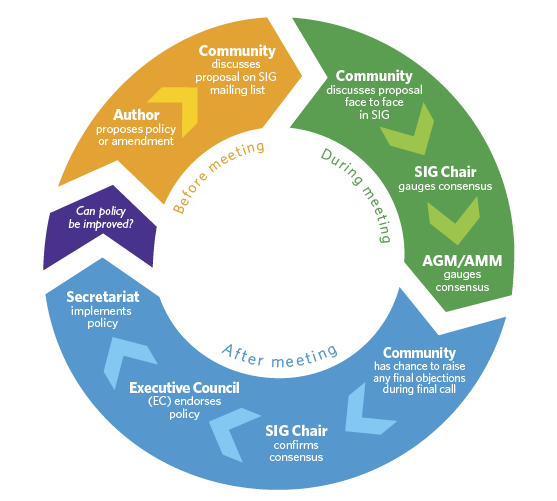 APNIC policies are decided by the Policy SIG using the Policy Development Process (PDP). The PDP is controlled by the community with support from the APNIC staff. The process includes discussions on the Policy SIG Mailing List and during the APNIC conference, at the OPM. The Policy Chairs judge if the community has reached consensus based on the discussion on the Policy SIG mailing list and at the OPM. SIG procedures are explained in the SIG Guidelines document, which includes information about the consensus process at APNIC. If some community members disagree with the proposal, they are asked to explain their objections. Objections are grouped into two levels of severity. A minor objection is one where the objector believes some problems may occur for some participants in the group if the proposal goes forward. Major objections are more serious and indicate a belief that the proposal would cause major problems for parts of the community. The community is asked to work together to address the objections or see if the proposal can be modified to overcome them. Consensus is reached on a proposal if the community is able to successfully work through all objections in this way. It is not necessary that everybody agrees with the proposal. ‘Rough consensus’ is the point where all objections have been resolved or given due consideration and the community believes the benefits outweigh the disadvantages.